On Scene: Show us your Harlem Shake! Show us your Harlem Shake! 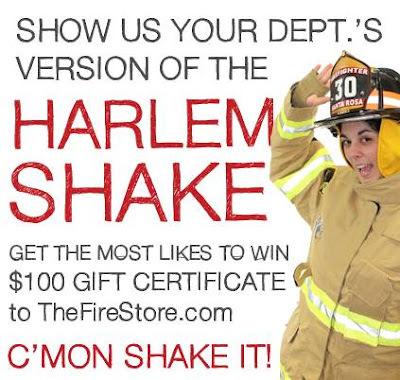 Last week we had a little fun doing TheFireStore's version of the Harlem Shake. If you didn't see it, check it out below, you don't want to miss it. But now it's YOUR TURN! Gather everyone at your Fire Department and video your version of The Harlem Shake. GET CREATIVE! HAVE FUN! And when you're done? Post the video on our Facebook Page, and the post with the most *likes* by 3/11/13 at 3pm EST will win a $100 gift certificate! Once you post your YouTube link to our page, share the post, gather as many votes/likes as you can to win! *video must be yours or your fire department's in order to win! Contest ends 3/11/13 at 3PM EST.